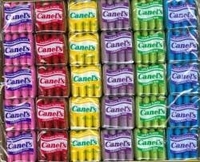 Canels gum is similar to chiclets chewing gum. They now come in fruity flavors kids love. Tutti Frutti, Cherry, Banana, Grape, Apple and Blueberry. You get 10 packages of each fruity flavors per box. This is not only a favorite gum of kids, but adults also love it. 60 packs of chewing gum with 4 pieces in each for a total of 240 pieces.